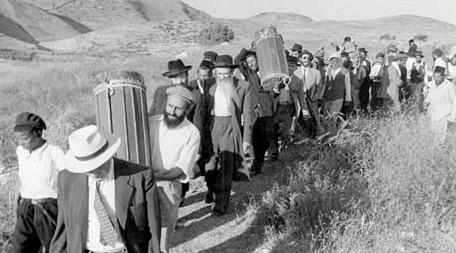 Jews flee West Bank after Jordan annexed the region in 1948. Israel liberated the region in 1967 after being attacked by Jordan. Having just taught a course on the Cultural Geography of the Middle East at a community college in Florida for "seniors" (over 55 years of age), I again encountered a unanimous belief among my students in what I would call the Most Widely Believed Myth of the political and military conflict between Israel and the Arabs. This universal belief, never challenged by the media, is that the United States was wholly or largely responsible for fully supporting Israel on the ground from the very beginning of its independence in May, 1948. The world has been inundated with a tsunami of Arab propaganda and crocodile tears shed for the "Palestinians" who have reveled in what they refer to as their Catastrophe or Holocaust (Nabka in Arabic). Their plight has been accompanied by unremitting criticism that the United States was the principal architect that stood behind Israel from the very beginning with money, manpower and arms. The fact is that President Truman eventually decided against the pro-Arab "professional opinion" of his Secretary of State, General George Marshall and the Arabists of the State Department. He accorded diplomatic recognition to the new Jewish state but never considered active military aid. His own memoirs recall how he felt betrayed by State Department officials and the American U.N. Ambassador, Warren Austin who pulled the rug out from under him one day after he promised Zionist leader Chaim Weitzman support for partition. American Jewish voting in the 1948 Presidential election leaned heavily for President Truman but also cast a substantial number of votes for third party "Progressive" leader Henry Wallace who had spoken out even more strongly on behalf of American support for the Zionist position and aid to Israel. It was actually not until the administration of President John Kennedy in the early 1960s that American arms shipments were made to Israel. The struggle of the Jewish community in Palestine was endorsed completely by what was then called "enlightened public opinion," above all by the political Left. Andrei Gromyko, at the UN, asserted the right of "the Jews of the whole world to the creation of a state of their own", something no official of the U.S. State Department has ever acknowledged. Soviet support in the U.N. for partition brought along an additional two votes (the Ukrainian and Bielorussian Republics within the USSR and the entire Soviet dominated block of East European states. Taking (as always) their lead from Moscow, the (hitherto anti-Zionist) Palestinian communist organizations merged their separate Arab and Jewish divisions in October, 1948, giving unconditional support to the Israeli war effort and urging the Israel Defense Forces to "drive on toward the Suez Canal and hand British Imperialism a stinging defeat"! At first, a "Skymaster" plane chartered from the U.S. to help in ferrying weapons to Palestine from Europe was forced by the FBI to return to the USA. By the end of May the Israeli Army (IDF) had absorbed about 20,000 Czech rifles, 2,800 machine-guns and over 27 million rounds of ammunition. Two weeks later an additional 10,000 rifles, 1,800 machine-guns and 20 million rounds of ammunition arrived. One Czech-Israeli project that alarmed the Western intelligence was the, so called, Czech Brigade, a unit composed of Jewish veterans of "Free Czechoslovakia", which fought with the British Army during WWII. The Brigade began training in August 1948 at four bases in Czechoslovakia. Czech assistance to Israel's military strength comprised a) small arms, b) 84 airplanes –– the outdated Czech built Avia S.199s, Spitfires and Messerschmidts that played a major role in the demoralization of enemy troops; c) military training and technical maintenance. On January 7, 1949, the Israeli air-force, consisting of several Spitfires and Czech built Messerschmidt Bf-109 fighters (transferred secretly from Czech bases to Israel), shot down five British-piloted Spitfires flying for the Egyptian air-force over the Sinai desert causing a major diplomatic embarrassment for the British government. According to British reports, based on informants within the Czech Government, the total Czech dollar income from export of arms and military services to the Middle East in 1948 was over $28 million, and Israel received 85% of this amount. As late as 1951, Czech Spitfires continued to arrive in Israel by ship from the Polish port of Gydiniya-Gdansk (Danzig). Since May, 2005 the Military Museum in Prague has displayed a special exhibition on the Czech aid to Israel in 1948. In contrast, the American State Department declared an embargo on all weapons and war material to both Jews and Arabs in Palestine, a move that only had one effect in practice. There was no Arab community in North America to speak of and given the fact that a substantial and overwhelmingly sympathetic Jewish community in the United States was anxious to aid the Jewish side, the embargo simply prevented a large part of this intended aid from reaching its destination. The small trickle of supplies and arms reaching Israel from North America was accomplished by smuggling. The U.S. vote in favor of partition was only de facto reflecting the State Department's care not to unnecessarily offend the Arab states whereas the Soviet vote recognized Israel de jure. But their numbers were a drop in the bucket compared to more than 200,000 Jewish immigrants from the Soviet dominated countries in Eastern Europe, notably, Poland, Bulgaria (almost 95% of the entire Jewish community) Romania, Yugoslavia, Czechoslovakia, the former Baltic States and even the Soviet Union who emigrated to Israel arriving in time to reach the front lines or replenish the depleted ranks of civilian manpower. Without both the arms and manpower sent from the "Socialist Camp", to aid the nascent Israeli state, it would have been crushed. Jewish Marxist theoreticians the world over including several high ranking Party activists, all dedicated anti-religious and anti-Zionist communists had followed the Party Line and even praised a vicious pogrom by Muslim fanatics carried out against ultra-Orthodox Jews in the town of Hebron in Palestine in 1929. The Party Line then was that the Arabs masses were demonstrating their anti-imperialist sentiment against British rule and its sponsorship of Zionism. "Palestine had become an important settlement of 600,000 souls, having developed a common national economy, a growing national culture and the first elements of Palestinian Jewish statehood and self-government." A 1947 CP-USA resolution entitled "Work Among the Jewish Masses" berated the Party's previous stand and proclaimed that "Jewish Marxists have not always displayed a positive attitude to the rights and interests of the Jewish People, to the special needs and problems of our own American Jewish national group and to the interests and rights of the Jewish Community in Palestine". The new reality that had been created in Palestine was a "Hebrew nation" that deserved the right to self-determination. Remarkably, the Soviet propaganda machine even praised the far Right underground groups of the Irgun and "Stern Gang" for their campaign of violence against the British authorities. Church Support in the U.S. The Jewish cause in Palestine enjoyed the support of a large section of mainstream and liberal Protestant churches and not primarily the "lobby" of Protestant Fundamentalists as is often portrayed today by critics of Zionism. As early as February 1941 and in spite of the wholehearted desire of the American Protestant establishment not to risk involvement in World War II, Reinhold Niebhur spoke out convincingly through the journal he founded "Christianity and Crisis" and sounded a clarion call of warning about Nazism. Its final goals were not simply the eradication of the Jews but the extirpation of Christianity and the abolition of the entire heritage of Christian and humanistic culture. This is the only kind of "World Without Zionism" that the Iranian and Arab leaders long for. Niebhur based his views not on any literal "Evangelical" interpretation of Biblical promises but the essentials of justice for the nations and also called for some form of compensation to those Arabs in Palestine who might be displaced if their own leaders refused to make any compromise possible. There was nothing "progressive" about those who supported the Arab side. The acknowledged leader of the Palestinian Arab cause was the Grand Mufti of Jerusalem, Haj Amin al-Husseini, who had fled from Palestine to Iraq to exile in Berlin where he led the "Arab office," met with Hitler whom he called "the Protector of Islam," served the Germans in Bosnia where he was instrumental in raising Muslim volunteers among the Bosnians to work with the SS. At the end of the war, the Yugoslav government declared him a war criminal and sentenced him to death. Palestinian Arabs still regard him as their original supreme leader. Lending active support to the Arab war effort were Falangist volunteers from Franco's Spain, Bosnian Muslims and Nazi renegades who had escaped the Allies in Europe. It was published in September, 2006 and has yet to appear in English translation. It documents the Arab sympathies for Nazism, particularly in Palestine and German attempts to mobilize and encourage the Arabs with their ideology, especially the Muslim Brotherhood, and the forces around the Grand Mufti of Jerusalem, Haj Amin al-Husseini, in Palestine. Nazi radio broadcasts to the Arabs between 1939 and 1945 constantly proclaimed the natural German sympathy for the Arab cause against Zionism and the Jews. German Middle East experts stressed "the natural alliance" between National Socialism and Islam. And such experts as the former German Ambassador in Cairo, Eberhard von Stohrer, reported to Hitler in 1941 that "the Fuhrer already held an outstanding position among the Arabs because of his fight against the Jews." Cüppers and Mallmann quote many original documents from the Nazi archives on this close relationship. From the late 1930s, the planning staffs dealing with the external affairs of the Reich in the Head Office of Reich Security (RSHA, Reichssecuritathauptamt, originally under the monstrous Gestapo-chief Reinhard Heydrich), sought to engulf the Arabian Peninsula and win control of the region's oil reserves. They dreamt of a pincer movement from the north via a defeated Soviet Union, and from the south via the Near East and Persia, in order to separate Great Britain from India. Thanks to the counteroffensive of the Red Army before Moscow in 1941/1942 and at Stalingrad in 1942/1943, and the defeat of the German Africa Corps with El Alamein, the Germans never managed to actively intervene in the Middle East militarily although they helped spark a pro-Axis coup in Baghdad in 1941. In the vote on partition in the UN, apart from the states with large Muslim minorities (like Yugoslavia and Ethiopia), the Arabs managed only to wheedle a few abstentions and one lone negative vote out of the most corrupt non-Muslim states. These included Cuba (voted against partition) and Mexico (abstained) eager to demonstrate their independence of U.S. influence and Latin American countries whose regimes had been pro-Axis until the final days of World War II such as Argentina and Chile (both abstained). All the West European nations (except Great Britain) voted for partition as well. No other issue to come before the U.N. has had such unanimous support from the European continent or cut across the ideological divide of communist and western sectors. The Jewish state was even supported by Richard Crossman, a member of the Anglo-American Committee of Inquiry on Palestine who had been handpicked by Britain's anti-Zionist Foreign Secretary, Ernest Bevin. Crossman, taking a principled stand, refused to endorse the Labor Party Line. He had visited the Displaced Persons camps in Germany where Jews who had sought entry into Palestine were being detained. He realized that their sense of desperation derived from a world with no place which they as Jews could truly call home. He wrote that when he started out he was ready to believe that Palestine was the "problem," but his experiences made him realize that it was the "solution." Some prominent Diaspora Jews, particularly among those who cannot escape the narcotic-like trance they have inherited as "progressives" and are essentially secular and ultra-critical of capitalism and American society with its underlying Christian values, have developed a new kind of psychological self-hatred to exhibit a disassociation from the State of Israel and their religious heritage. They are upset over the close Israeli-American friendship and outdo themselves in slanderous attacks on President Bush. They easily see Israel's many flaws (both real and imagined) among which, the worst is that Israel, like America is a "privileged" society enjoying wealth amidst a world of misery. They flatter themselves that they are the modern day prophets who see "the writing on the subway walls" (as Paul Simon sung). They have earned for themselves the justifiable contempt of most Israeli Jews (both religious and secular) for their moral duplicity. As long ago as 1958 this trend was clearly seen in the interviews given by Leon Uris, the author of the best selling novel "Exodus" in explaining why he wrote the book. He had in mind successful Jewish authors such as Philip Roth, Saul Bellow and Bernard Melamud whom he called "professional apologists" (for being Jews). Uris set out to tell the story of Israel's rebirth as the story of Jewish heroes rather than the psychological analyses of individuals who grew up damning their fathers and hating their mothers and wondering why they were born. Uris unapologetically made a pro-Israel film only a decade after every Jewish movie producer had turned down making the film Gentleman's Agreement (1947; starring Gregory Peck) about polite anti-Semitism. It was made into a film by the great Greek-American producer, Elia Kazan who was later turned on with vengeance for cooperating with the House un-American Activities Committee revealing communist influence in Hollywood. Today's crowd of "progressive" Jewish actors and entertainers outdo even the writers Uris attacked fifty years ago. Woody Allen, Barbra Streisand, Dustin Hoffman and Richard Dreyfus are among the most visible and acidic critics of American policy in Iraq and have called for the impeachment of President Bush. They naturally proclaim themselves to be supporters of Israel without realizing how convoluted their antics appear to others. They are sarcastically referred to by many in Israel as "beautiful souls" i.e., by those who reject their elitism of supposed high moral values so out of place in the Arab Middle East and as remote from the real world as were the great majority of the victims of the Holocaust whose Jewish values prevented them from attributing such evil to the Germans. Most of the victims of the Holocaust were as deaf and blind to the fate that awaited them as surely as today's Hollywood "stars" are with regard to their calls for a selective "hands-off policy" or the future consequences of a return to Ba'athist rule in Iraq, the likely outcome of their incessant calls for immediate and total withdrawal of Allied involvement. Two of these "stars", Streisand and Hoffman recently played the lead roles in self-mocking doubly ironic roles of a liberated Jewish couple in the comedy "Meet the Fockers". This is a grotesque example of art imitating reality (or is it the other way round?). The couple in the film have nothing but disdain for traditional American manly heroic virtues of military valor or achievement in sports nor do they demonstrate any respect whatsoever for what were classical Jewish virtues of learning and piety. They exhibit the most crass, offensive loud and vulgar behavior constantly embarrassing their son. For them and much of the Left, the very concept of civility is regarded with contempt. Whatever the differences between secular and religious Israelis, they pale before the monumental differences that separate life in the State of Israel with all its inherent promises, risks and dangers from the Diaspora's ultra idealized concerns and sensibilities. This is as true today was it was in 1948. The Political Left today refuses to admit that it stood wholeheartedly behind Israel much like the exercise performed by Stalin's staff of photographers who could surgically extract and obliterate old time Bolsheviks who had fallen out of his favor. Today's media never attempt (not even the History Channel) to explain how it was Soviet and East Block aid and not American support that was the crucial factor which brought both essential weapons and manpower to the beleaguered newborn Israeli state in 1948-49 and enabled it to turn the tide of battle and justifiably hand the Palestinian Arabs and their allies their "Nabka." Soviet hopes that they might eventually pressure the new and profoundly democratic Israeli state to side with them in the Cold War were hopelessly naïve[*]. Amnesia is a common malady among politicians. Democrats and others who have soured on American intervention in Iraq now have great difficulty remembering Iraqi aggression against Iran, Kuwait and the atrocities committed against the Kurds, Assyrians, Marsh Arabs and all opponents of the regime. Even President Bush and his supporters seem to suffer from amnesia and are reluctant or incapable of setting the record straight about 1948. [*] see Uri Waller, Israel Between East and West; Israel's Foreign Policy Orientation, 1948-56. Cambridge University. 1990, 302 pages, ISBN 0521362490. Posted August 4, 2010. Visit Mr. Berdichevsky's website at www.nberdichevsky.com. Norman Berdichevsky is a native New Yorker who lives in Orlando, Florida. He holds a Ph.D. in Human Geography from the University of Wisconsin-Madison (1974) and is the author of The Danish-German Border Dispute (Academica Press, 2002), Nations, Language and Citizenship (McFarland & Co., Inc., 2004) and Spanish Vignettes: An Offbeat Look into Spain's Culture, Society & History (Santana Books, Malaga, Spain. 2004). He is the author of more than 175 articles and book reviews that have appeared in a variety of American, British, Danish, Israeli and Spanish periodicals. Dr. Berdichevsky teaches Hebrew at the University of Central Florida and he writes a regular monthly column for the online publication New English Review. Arabs in the Holy Land: Natives or Aliens?